Here are just a few of many quintessential Pilsen experiences – all packed into a mile-a-minute 24 hours. Mexican grocery stores, restaurants and bakeries – many of them fixtures of the neighborhood for decades – give Pilsen its character, filling the streets with taste-bud-teasing aromas from the early hours of the morning to, well, the early hours of the morning. Undoubtedly, your 24 hours in Pilsen will start with breakfast. 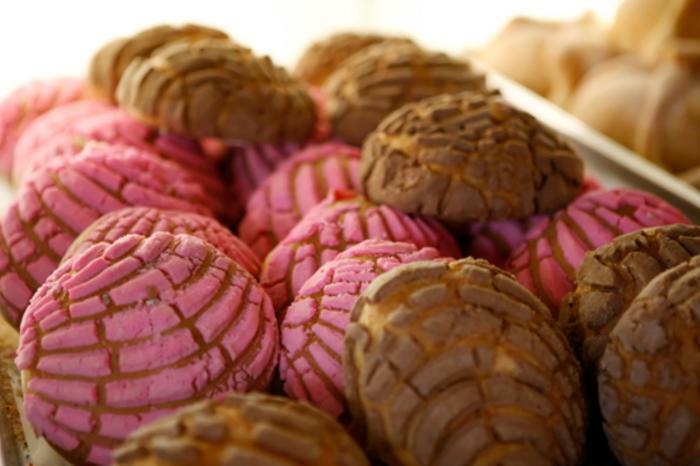 Grab goodies on the go at Panderia Nuevo Leon (1634 W 18th St), a traditional self-service Mexican bakery that’s been in existence since 1973. Take your pick from conchas, gorditas dulces, empanadas, tortillas, cookies, sweets and pan dulce made from scratch daily, as well as a growing list of vegan breads, sweets and tortillas. It’s open 5:30am-9pm daily, except Saturday and Sunday when it opens at 6am. Next, head to the CTA 18th Street L station, just west of Paulina Street, where you’ll find your Chicago Architecture Center (CAC) tour guide. The CAC’s 2-hour Discover Pilsen walking tour (which departs at 10am and costs $26pp) is the perfect neighborhood orientation, introducing you to landmark churches, residences, cultural sites and commercial buildings, as well as PIlsen&apos;s iconic murals and streetscapes. The tour ends on Damen Ave at the CTA Pink Line L station. It’s hard to resist the quaint and quirky boutiques and galleries that line the streets of Pilsen. So as you meander lunchwards, shop hop and soak in the neighborhood’s artisanal vibe. A couple of my favorites: Chocolate Uzma (1900 S Halsted St), where you’ll find small-batch, handmade chocolates in a lovely boutique setting, and Verdant Matter at The Shudio (1152 W 18th St), an utterly charming garden and gift shop that sells handmade and eco-friendly products. There’s no end of options for food, but I’ll clue you in to just two of my favorites. Dusek’s Board & Beer is the perfect combination of beer, food and hospitality – and its list of accolades proves it. 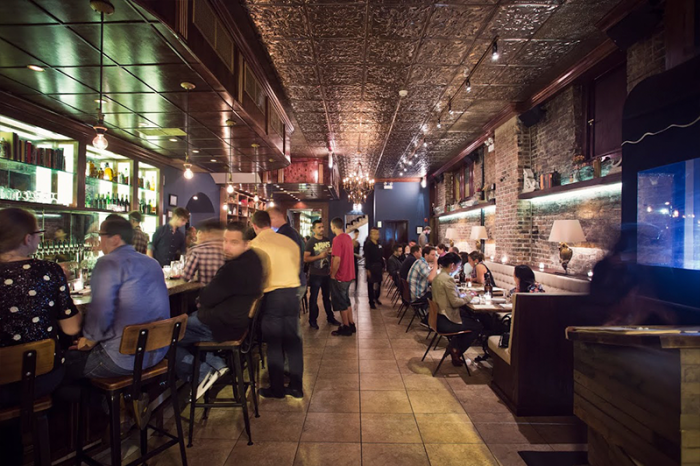 Dusek’s was named “Best New Restaurant” by both Chicago Magazine and Thrillist, featured on The Food Network, and awarded one star in the MICHELIN Guide Chicago in 2016, 2017 and 2018. Its interior is super inviting, but I always opt for the covered patio in warmer weather; it’s the perfect place to watch Pilsen life unfold. The menu is seasonal, so you’re always in for something new and creative. Currently up: Iron Roasted P.E.I. Mussels, Thai Sausage Sandwich, and the Juicy Lucy Burger. Another plus, Dusek’s shares its landmark location with live music venue Thalia Hall and ever-popular late-night hangouts the Punch House and Tack Room. More on those later! Dusek’s is open 11am-2am weekdays, 9am-2am weekends. If you’re craving the more traditional side of Pilsen, head to Taqueria Saber y Sazon (2018 S Blue Island Ave) for some of the best tacos in town. An explosion of festive color greets you both inside and out, with a rainbow-hued mural on the façade and burnt orange walls and green window sills adorning the interior. Feast on equally colorful traditional dishes, including Camarones a la Diabla, Tampiquena, and red or green Chilaquiles. The Taqueria is open 10am-10pm daily except Sundays. 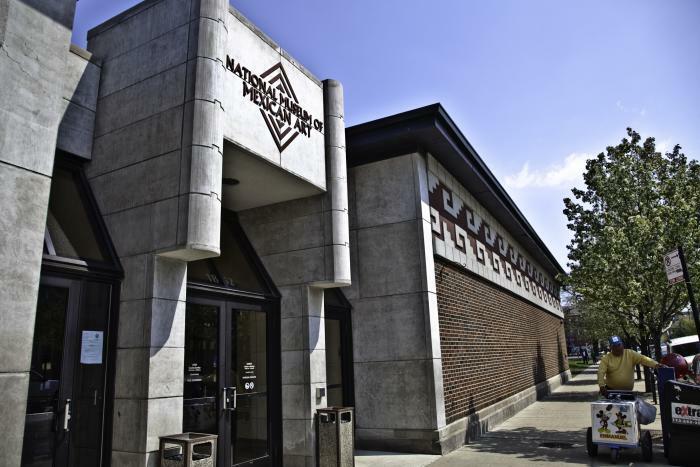 Your next stop is the National Museum of Mexican Art (1852 W 19thSt), which features a breathtaking collection of works in an equally breathtaking building. Three-thousand years of creativity are represented here, with objects as diverse as ephemera, photography, folk art, paintings, sculpture, prints, drawings and textiles. Current exhibitions include Peeling Off the Grey (through October 7), which delves into the impact of gentrification on neighborhoods like Pilsen, interpreted through the eyes of individual artists. Upcoming is Día de Muertos: A Spiritual Legacy in the museum’s Main Gallery (September 21 - December 9), with all the pageantry and mysticism of the evocative Day of the Dead. The museum is open 10am-5pm daily except Mondays, and admission is free. If you’re lucky enough to visit Pilsen on the second Friday of the month, you’ll be wowed by the artwork you’ll see in the Chicago Arts District. First, though, take a detour to the nearby Ghost Church at 19th& Peoria – the ultimate in Instagram-worthiness. What you’ll find here are the one-of-a-kind preserved ruins of the abandoned 1880s Zion Evangelical Lutheran Church. Its stately façade features a 90-foot bell tower, monumental wooden doors and ogee and bell arch windows that exude a kind of eerie beauty. It reminds some people of a film set (just the façade, no building behind), and others of staring down into the Roman Forum. Whatever your take, it’s a surreal experience, and the chance for a moment of Zen in an otherwise jam-packed day. Now more about 2nd Fridays Gallery Night. The predominance of cool murals that are a trademark of the Pilsen neighborhood may give you an inkling of the thriving arts community that exists here. 2nd Fridays Gallery Night is a monthly event in which galleries and artists’ studios centered around South Halsted Street (beginning at 1711 and ending at 2005 South Halsted) host opening receptions from 6-9pm. The Chicago Arts District, as its known, opens its doors free of charge, giving you an opportunity to explore progressive contemporary art, created by emerging contemporary artists. Pick up a map at the Information Center, 1945 S. Halted, to plan your route. If you’re resisting the urge to return to Dusek’s for dinner, head to Honky Tonk BBQ (1800 S Racine Ave) instead. 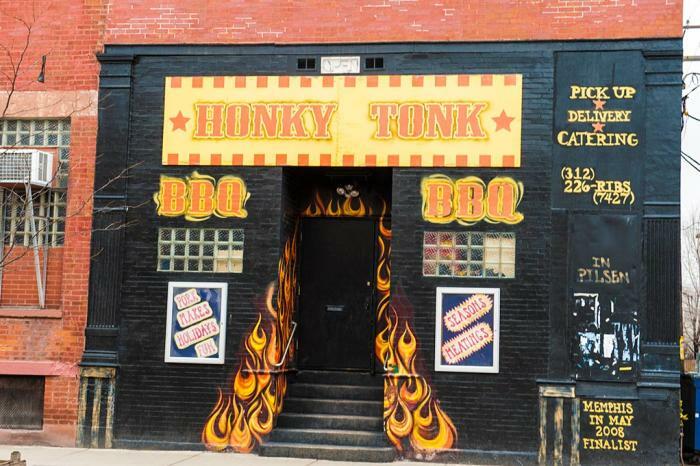 Honky Tonk serves up traditional Memphis-style meats, meaning they’re dry rubbed and roasted with wood and charcoal, creating a salty-sweet, pepper and spice combination of flavors. Added bonus: You look super cool walking through a painted flaming doorway. Honky Tonk is open 4pm-2am Tuesday-Friday & Sunday, 4pm-3am Saturday (closed Mondays). Not in the mood for BBQ? Then prepare yourself for something pretty special at Alulu Brewery & Pub (2011 S Laflin St). All of Alulu’s exclusive small-batch craft beer is made in-house in its second-floor brewery, and is available only at this location. Not only that, but a chef-driven menu tantalizes with an eclectic mix of dishes (using locally sourced ingredients), combining Eastern European cuisine with global influences. Think Masala Frites, Oyster Mushroom Tempura and Swiss Sliders, and Vegan Korean BBQ Pulled Jackfruit. Alulu is open 5pm-2am Monday, Wednesday, Thursday, 3pm-Midnight Friday, 3pm-3am Saturday, 3pm-2am Sunday (closed Tuesdays). Pilsen is home to one of the best music venues in the city. 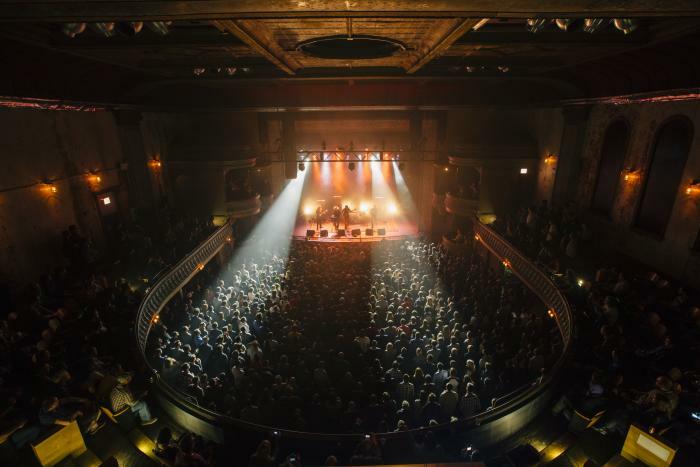 Thalia Hall, which shares the same landmark building as Dusek’s, is a beautiful space, combining ornate architectural elements (the original architects, Faber & Pagel, modeled the original 1892 venue after the Prague Opera House) with state-of-the-art acoustics. Check out the schedule and book your tickets for a great show, not least Ziggy Marley on August 28, Henry Rollins on September 24, and Ty Segall on November 2. 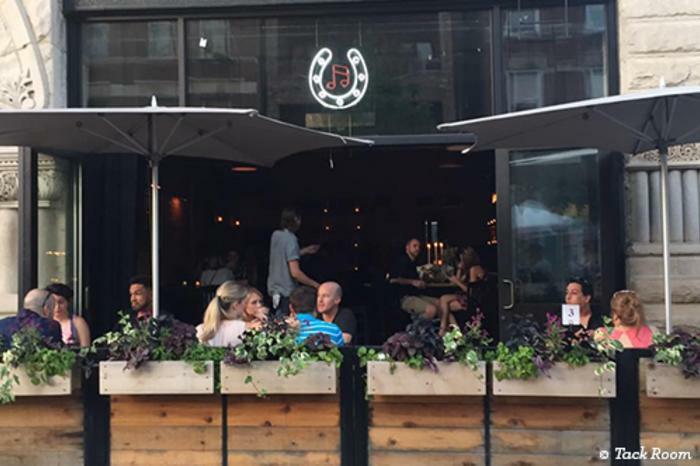 Afterwards, stick around for craft cocktails and bites at the Punch House (in the building’s basement) or more live music, cocktailing and late-night snacking at the recently opened Tack Room (located in the former stables). Punch House is open Sunday–Friday 6pm–2am and Saturday 6pm–3am (with food available until 1am), while the Tack Room is open Thursday and Friday 6pm-2am and Saturday 6pm-3am. 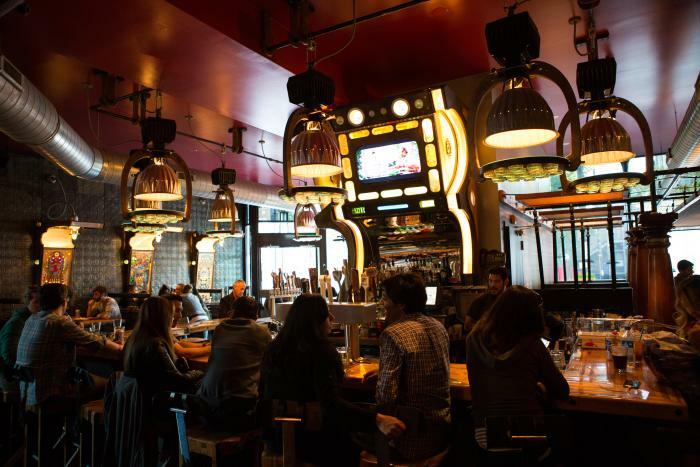 If you’re in the mood for something a little different, head to eco-friendly Simone’s bar and Mexican-inspired grill or Skylark, Pilsen’s quintessential dive bar. At Simone’s, you can sit outside in the summer months, or venture inside for DJs, trivia, live music and karaoke. 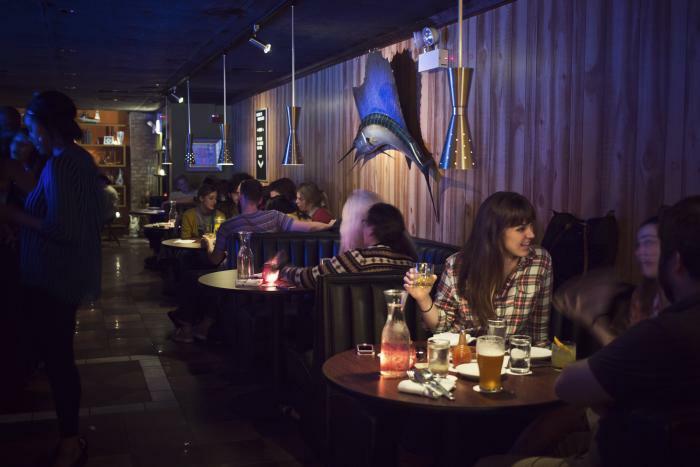 Cash-only Skylark (2149 S Halsted St) is a low-key, dimly lit haven, featuring one of the most flattering photo booths in town, a bar menu (everybody loves the tater tots and five dipping sauces), and live music on Monday nights (suggested donation $5). It’s basically a rec room in a bar! Simone’s is open 11:30-am-2am daily (3am close on Saturdays), while Skylark is open 4pm-2pm daily (3am close on Saturdays). That just about covers your 9am-2am non-stop itinerary. You can always catch up on sleep when you get home. Pilsen is a true community, which means you’ll have to venture a little farther afield to find a hotel. The budget-friendly Jaslin Hotel lies 1.15 miles from Pilsen in neighboring Chinatown. This cozy and inviting hotel exudes warmth, with guest rooms appointed in soothing earth tones and featuring marble-clad bathrooms. You’ll also enjoy sweeping views of the city, Chicago River, and the world-famous Chicago skyline. Prices start at $159 per night. If you’re looking for more of an intimate boutique experience, book a room at Wheeler Mansion, approximately 2 miles from Pilsen. It’s housed in a beautiful historic building, dating from 1870, with its own winter ice-skating rink, and soccer/croquet amenities in the summer. There’s also an impressive art collection, which is only part of the reason the hotel has been featured in numerous design magazines. It’s the perfect integration of traditional and modern, with 11 rooms — each unique — filled with a healthy dose of antiques and all the modern comforts. For a bit of a splurge, get an in-room massage! From approx. $327 per night. Also approximately 2 miles from Pilsen you’ll find the South Loop’s four-star Marriott Marquis Chicago. This hotel is imbued with contemporary luxuriousness. Clean-lined, sleek guest rooms command impressive views over the city. 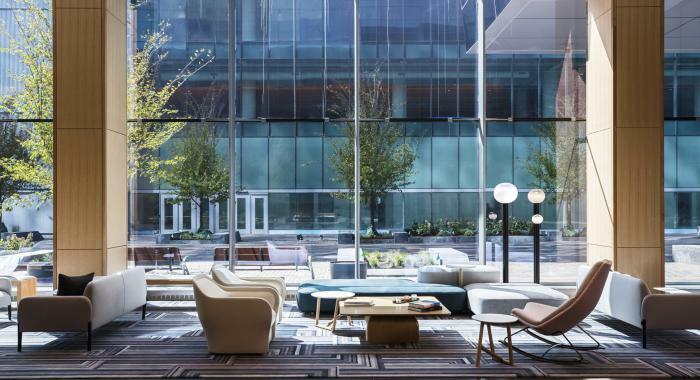 And you’ll have all of life’s luxuries at your fingertips, including a roof terrace; a 24/7 fitness center; premium bedding and pillow menus in each of its 1205 rooms; five restaurants; two coffee shops; a snack bar; and two bars/lounges. Try Woven + Bound, a swish restaurant bathed in natural light, and the causal 2121 Pantry, a great place to grab your morning coffee. Prices start at $769 per night.